3YOURMIND offers intelligent 3D printing solutions for industry and architecture. The comparison tool on 3yourmind.com presents a convenient way of ordering a 3D printed model of your prototype online. Users can upload their 3D file, which is automatically repaired, to achieve a better print. The user can compare prices of various 3D printing services, and choose from different materials. At 3YOURMIND, clients and partners include DAX-30 companies. 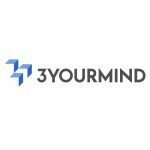 3YOURMIND combines strategic thinking with technological expertise, in the industrial practices of today. Experienced 3D printing consultants assist businesses in all matters relating to 3D printing solutions, including the setup and implementation of 3D printing technologies and profit maximization.